economies of scale and common sourcing strategies. 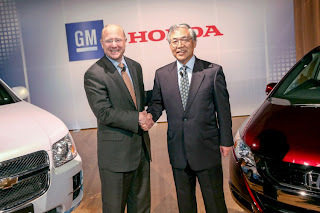 GM and Honda plan to work together with stakeholders to further advance refueling infrastructure, which is critical for the long-term viability and consumer acceptance of fuel cell vehicles. "This collaboration builds upon Honda and GM's strengths as leaders in hydrogen fuel cell technology," said Dan Akerson, GM Chairman and CEO. "We are convinced this is the best way to develop this important technology, which has the potential to help reduce the dependence on petroleum and establish sustainable mobility." Takanobu Ito, President & CEO of Honda Motor Co. Ltd. said, "Among all zero CO2 emission technologies, fuel cell electric vehicles have a definitive advantage with range and refueling time that is as good as conventional gasoline cars. Honda and GM are eager to accelerate the market penetration of this ultimate clean mobility technology and I am excited to form this collaboration to fuse our leading fuel cell technologies and create an advanced system that will be both more capable and more affordable."